Why are airline meal portions so small, even on long-haul flights ? Sometimes it's not even enough for children, let alone adults. I have some assumptions, but I would like to submit this question to those who are in a position to know the genuine reason(s). Hungry passengers might choose another airline next time, so I don't think it's a winning marketing strategy. Some answers say that larger meals are not necessary, because passengers don't burn a lot of calories while sitting. The point is entirely moot. People get hungry when their body gets less to eat than it is used to. The amount of burned calories on a single day is not what causes hunger. Much to the contrary – after doing lots of sport, I'm tired. Not hungry at all. I work for an airline, and let me share another perspective. It is often said that airlines are "greedy" people. Well, we are not more greedy than any other business, so we are just average people really. But there are limitations on what we can put on a passenger's meal: namely weight and space. Both weight and space are precious on a commercial aircraft, as you probably already know. The cart holding meals is actually surprisingly small; barely one feet across and waist high. You can put everyone's meal in a small kitchen in one of those tiny apartments in busy cities. So there is a limitation on how big the plastic tray is. That, in turn, limits the amount of food on the tray. More over, not every kind of food can be served mid-air. Freshly cooked food such as fried chicken are out of the question, for example. The food also has to be "not messy" when eaten, and acceptable to a wide variety of passengers from different cultures and different diets. Most aircraft fly return routes, i.e. they depart from the main hub, land at a destination, then turn around and land at the main hub again. That's two flights. Depending on the airline, the route and the food served, the meals for the return trip are actually loaded at the main hub. This wouldn't apply if it is a 13-hour long trip for example, but it may well be the case for short trips. The catering companies charge us by food cart. Sometimes there would be the dilemma when the number of meals is just over our capacity, but we do not what to hire an additional cart. It is either a cart used to its maximum, or no cart at all. And of course that cart has to go to some slot in the gallery. You are typically going to be sitting down and getting very limited exercise. On a long haul flight of 12 hours, based on a 2000 kcal/day requirement, the average person will burn in and around 1000 calories. 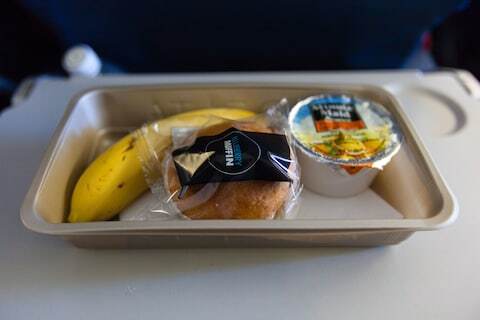 A conservative estimate for the calories in that small breakfast picture would be around 300, and that's a New York to London flight, which is in the 6-7 hour (i.e. 500-600 calorie) range, and on which another, more substantial, meal is also served not long after takeoff. Add to that calories from drinks and snacks and I'd suspect that the typical passenger over-consumes on a long-haul flight. I think most people choose between airlines based on the cost of airfare, and not the quantity or even quality of in-flight meal service, therefore airlines are not incentivized to compete on those. Then their goal is to serve food that is just good enough for the majority of passengers. Increasing portions to satisfy the hungriest passenger on every flight would be inefficient, since at that extreme every other passenger would leave some part of the meal uneaten. Frequent fliers who dislike the quality of airplane food just bring their own food. You could do the same, and bring your own supplementary food if you aren't satisfied with the quantity of airplane food. Why spend an extra X dollars on a more expensive plane ticket merely for more food, when you could just bring X dollars of (non-liquid) food onto the plane? The selection of food off the plane, and especially outside the airport, is certainly much better than the selection on the plane. You could also ask the flight attendant for an extra meal. They usually have a few extra, and that is one way they can sufficiently serve the passengers with big appetites without wasting a lot of food on the rest. In addition to the good answers do keep in mind your ticket class! First and business class food is in quality good to outstanding, depending on the airline. In terms of quantity, in higher classes you'll also be served multiple courses and / or have access to more at your own choice. Additionally it is a logistics problem as well. The more food is stored, the less paying cargo can the plane carry. Since the OP has a strong opinion on this matter and has been seen debating that the suggestions given already are wrong, here is exactly what the OP doesnt want to hear. That’s the answer to this question. Google will help with that term. And also, an airplane is not a hotel where we primarily go to feed our children. If your children ‘go hungry’ on flights because the meal portions are small; You are definitely not well prepared. Besides, airlines do allow you to chose your meal preferences well in advance specially for children and at that point you may be able put in a request for a larger meal. I'm not technically a frequent flyer but I've flown quite a bit (more than 100 long haul flights, 8+ hours, say). In my experience, people very rarely finish all their food. So my anecdotal experience contradicts the assumption in the question: the portions look fine related to what the average passenger consumes. Technically they're not large or small. They are appropriately sized for the service, passenger demographic and city pair of the flight. The airlines continuously work with their caterers to size meals and other provisions to feed passenger and reduce weight and...wait for it...food waste. Yes, for every person who 'asks' why meals are so small, there will be one who will demand airlines address food waste. Remember, everything not consumed during the flight has to be disposed of. Anyway, if you think the single serving is too small, the easiest solution is wait for the flight attendants to complete the service, then ask for another one. Note, you can ask whey they serve you, but will likely ask you to wait until all other passengers are served first. The second easiest solution is to book a higher class of service where plenty of food available, sometimes even a buffet. Not the answer you're looking for? Browse other questions tagged air-travel airlines food-and-drink in-flight-services cabin-crew or ask your own question. Whose responsibility is update to meal preference? Why only earbud style earphones? How did the cabin crew know that I didn't get my preferred meal in a previous flight? How are different meal ratios calculated for flights? Why do airlines often serve a small dry snack shortly before a larger meal?